The 4th segment of the European documentary "Flavors of West Japan" — which features a Mellow Monk green tea grower–artisan in the segment on Kyushu — takes us to Kyoto. There, we see such cultural highlights as Nijo Castle, Kiyomizu Temple, and the Gion district. Also presented is the green tea of Kyoto, which, unlike our Kyushu-style green tea, is usually slightly roasted instead of steamed. 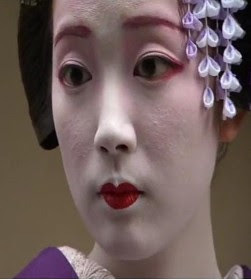 One of this segment's highlights is an interview with a demure maiko named Fumisono (above), who talks about her profession and its rigorous training.